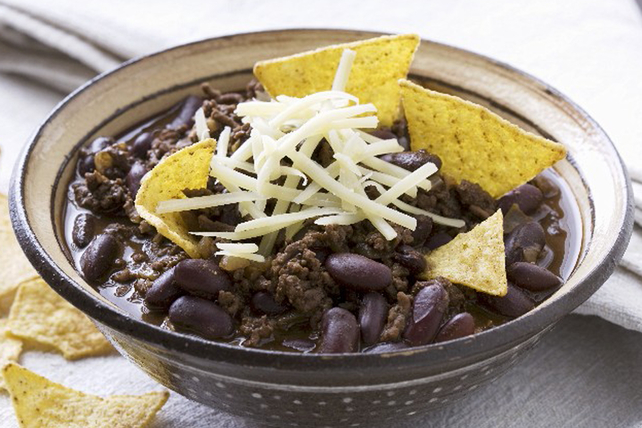 Chopped bacon and extra-lean ground beef put the con carne in this family-pleasing chili. For the spicy, we added a sliced jalapeño pepper! Cook and stir bacon in Dutch oven or stockpot on medium heat until crisp. Remove from pan with slotted spoon; drain on paper towels. Discard all but 1 Tbsp. drippings from pan. Reserve 1/4 cup onions. Add remaining onions to reserved drippings in pan along with the ground beef, garlic and chili powder; cook until meat is evenly browned, stirring frequently. Meanwhile, mash 1 cup beans in small bowl. Add mashed beans, remaining whole beans, salsa and water to meat mixture; mix well. Bring to boil; cover. Simmer on low heat 15 min., stirring occasionally. Stir in bacon. Serve chili topped with reserved onions and remaining ingredients. Substitute ground pork for the ground beef.